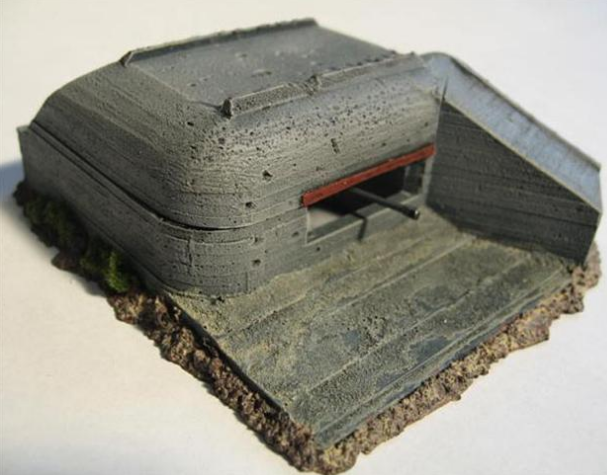 These bunkers were only a tiny piece of a huge complex of over 10,000 bunkers which were constructed in a two year period between 1943 and 1944 as part of Hitler’s Atlantic Wall. The length of the Atlantic Wall was an incredible 5,300km as it stretched from Northern Norway along the Atlantic coast to the French border with Spain. The part of the wall facing England was the strongest part of the wall, with the highest number of defences. 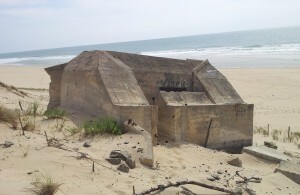 Of the bunkers constructed over 600 were of the H667 type, above. The Todt Organisation were responsible for the construction work and it is estimated that in total 13 million cubic metres of concrete were used in the Atlantic Wall. To put this in perspective this was over five times the amount used in the Hoover Dam. The German Army, during the first part of the Second World War, demonstrating how fixed defences were easily overcome with Blitzkrieg tactics. But then in latter half of the war concentrated on constructing hugely ambitious fortifications, which had little influence on the course of the war. 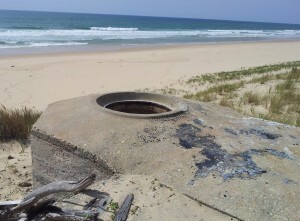 The design and construction of the bunker foundations are very poor considering their location on loose sand close to the beach. 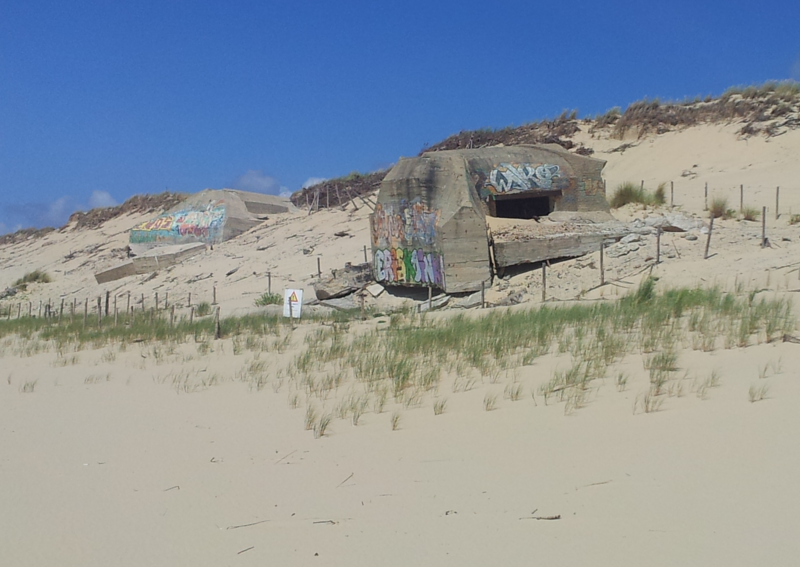 As a result both large bunkers have subsided and are now lying at an angle. But they presumably were not intended for a long life span. 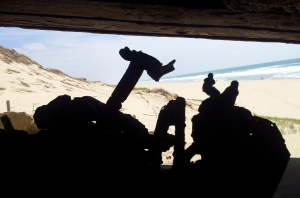 The H667 bunkers contain rusted 50mm anti-tank guns and are orientated to direct fire along the beach and not against ships at sea. 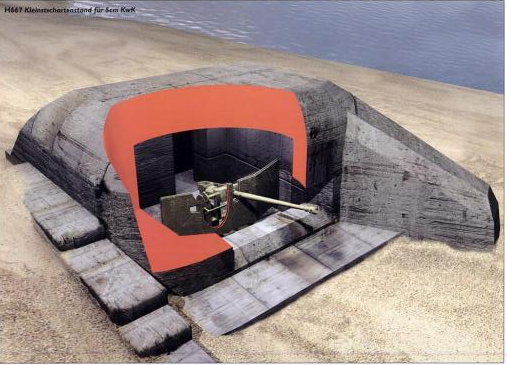 For additional protection against naval fire a large thick reinforced concrete wall protects each bunker opening, see picture above. 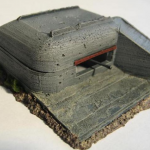 The bunkers are now surrounded by a low wire fence. 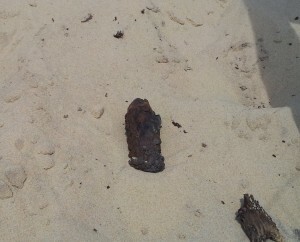 While walking around the outside of this I felt something hard below the surface of the sand. 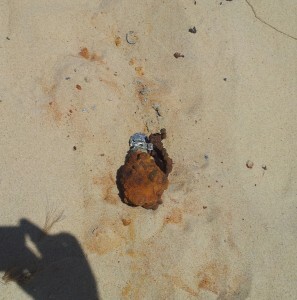 I pulled back the sand to reveal an old rusted, but what seemed to be live, grenade, see photograph. There was a different type of metal at the top of each grenade which hasn’t rusted at all compared with the rest. The grenade is the same type as used by the Allies, and not the stick type typically used by the German army. Therefore presumably it was part of captured stockpiles during the fall of France. Not too far away I discovered another buried grenade and one of the shells for the anti-tank gun (see photo) and a piece of old barbed wire. 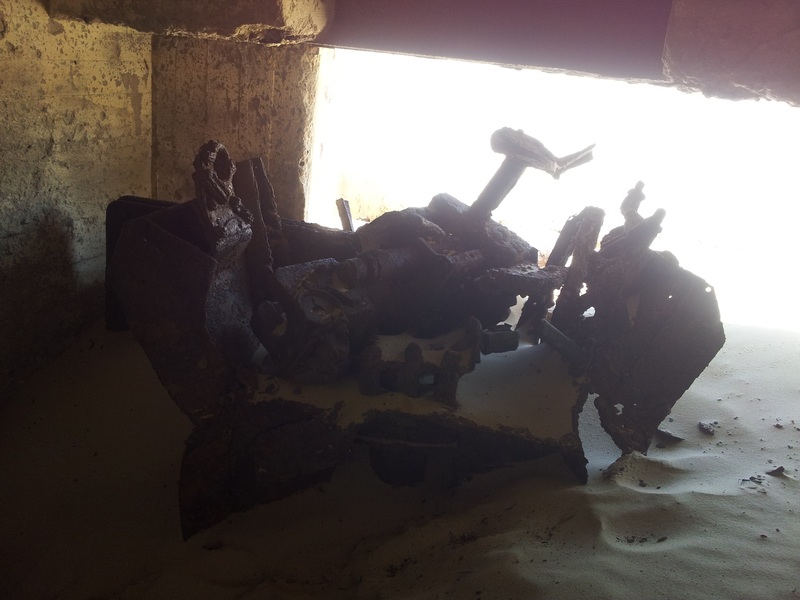 Unbelievingly all these were buried just slightly beneath the sand and outside the perimeter fence surrounding the bunker. I wonder how much ammunition would be found if you actually spent time looking for it. 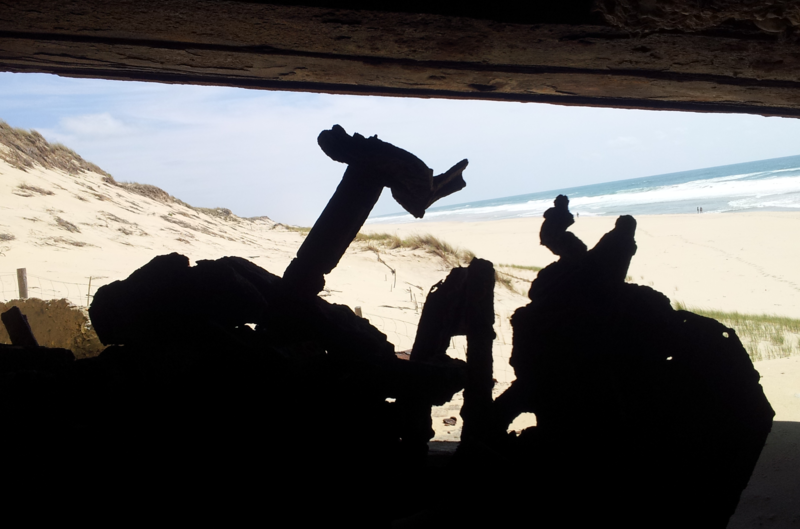 The fact that so much ammunition was left lying around must mean that defenders left the bunker in a hurry. Presumably they tried to bury it quickly and since then the site has simply been abandoned. Its relatively isolated location means that no one has taken souvenirs. I re-positioned the shell and grenades inside the wire fence, just in case. But it demonstrated to me that these bunkers can be dangerous and that the French presumably don’t have resources to clean up so many sites. 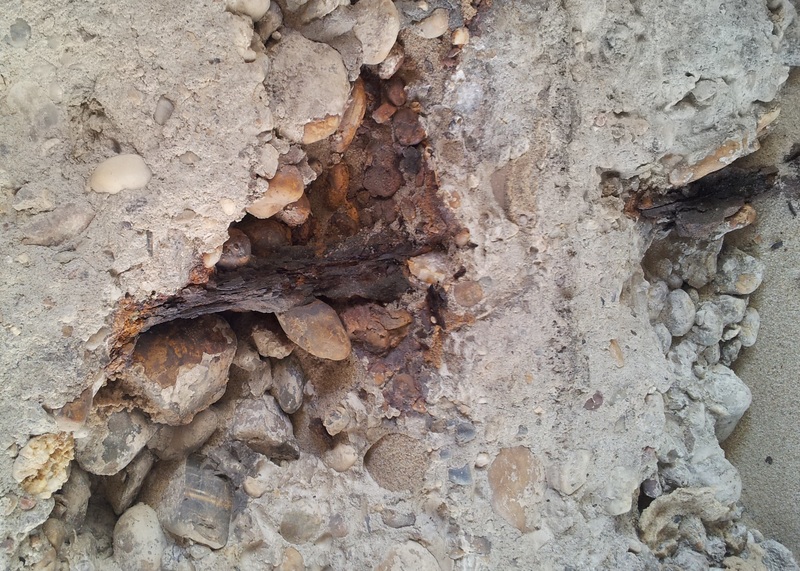 The concrete was in surprisingly good condition considering its age and exposed location. Only a few areas of serious corrosion to the internal reinforcement were noticeable, see photograph later. 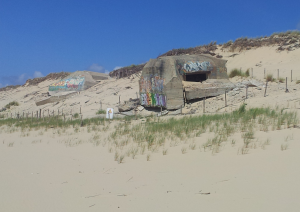 If you are inspecting these bunkers on your next trip to France, be careful and watch what you are walking on! It’s not my first time to visit this web site, i am browsing this site dailly and take pleasant facts from here every day.